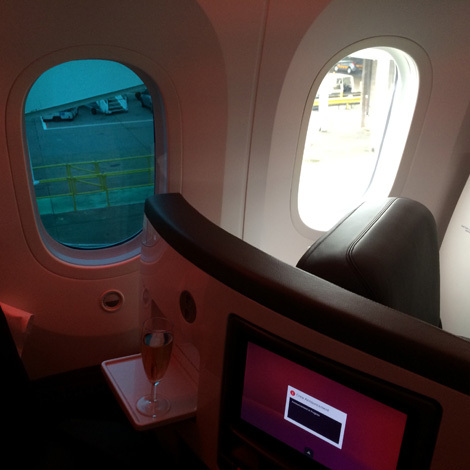 Virgin Atlantic launched its first B787-9 passenger flight to Boston yesterday. The airline will temporarily swap the aircraft for an A340-600 for two weeks from Friday until November 14 (see news, October 28), but once back, the Dreamliner will serve the US city six-times weekly from London Heathrow, with Washington DC and New York JFK/Newark targetted for B787-9 service in the next five months. So what can passengers expect? 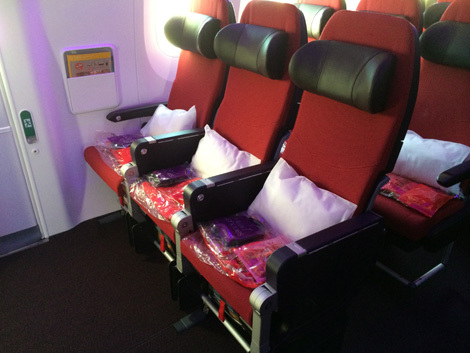 Virgin’s Dreamliner can accommodate 264 passengers, with 31 Upper Class class seats that flip over to create fully-flat beds, 35 seats in premium economy and 198 in economy. Here is a seat plan – as you can see, Upper Class is configured 1-1-1, premium economy 2-3-2 and economy 3-3-3. 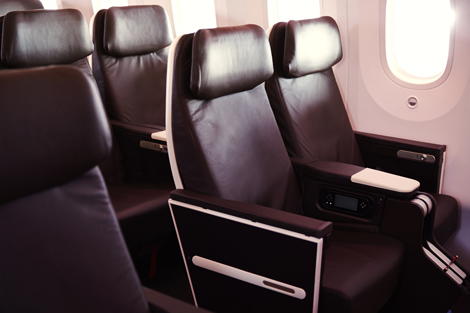 A Panasonic Avionics Vera Touch 2 IFE system is installed throughout the cabins, with 11.1-inch screens in Upper Class and premium economy, and nine-inch screens in economy. The on-demand entertainment features about 60 movies, 70 hours of TV and 285 music albums. There is also a seat chat function for sending messages to other passengers and a flight map. Wifi for the duration of the journey costs £14.99. All seats have access to universal power sockets (either individual or two between three people). 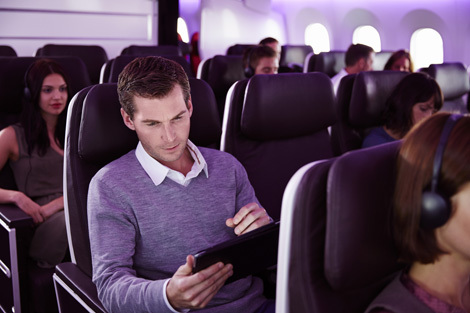 The ability to make phones calls in-flight will be introduced by next summer (you can already do this on many of Virgin’s other planes). Reuben Arnold, director of brand and customer experience, told Business Traveller: “While there are a lot of enhancements and new things, the on-board environment is about creating consistency with the rest of our fleet. 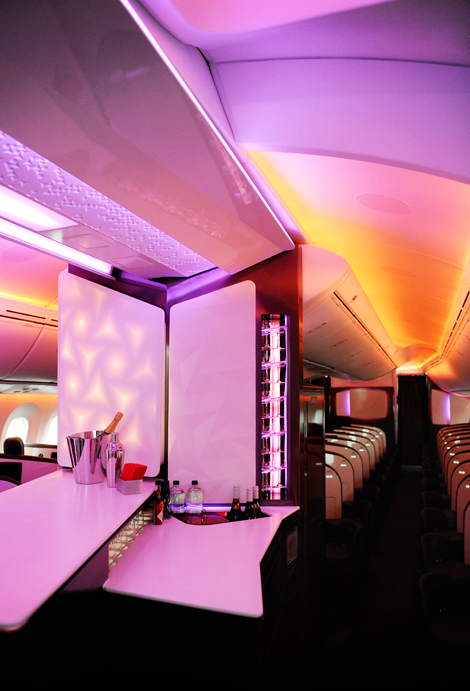 “The Upper Class bar is a good example that is on all of our planes, but we really want to make it work hard for the space we give up to it. You can seat four people — it’s a place you can gather around it, rather than on the other planes where it is just a counter with a member of crew behind. “From a business traveller’s perspective, what our customers tell us they value most about it is being able to leave their seat and go and work at the bar, meet other people, meet colleagues. We get a lot of interesting customers so it’s a great place to connect. For more on Upper Class, you can read our reviews of the outbound and return inaugurals between London and Atlanta. 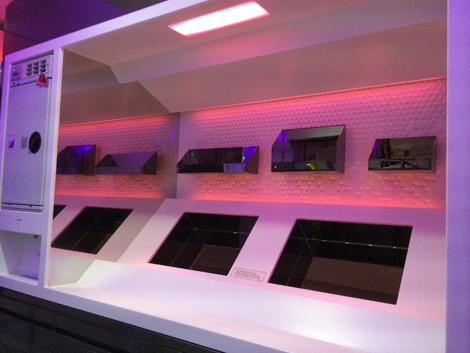 Arnold said: “Moving into premium economy, there’s the Wonderwall [in the galley] — it’s a great place to stretch your legs and socialise. 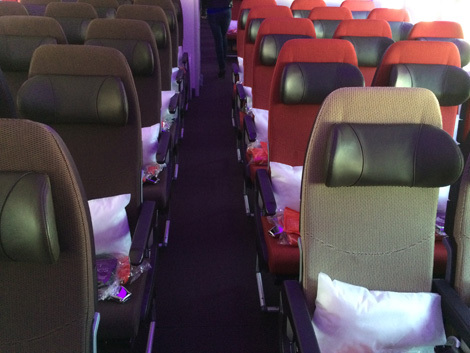 The premium economy seat is slim and streamlined. 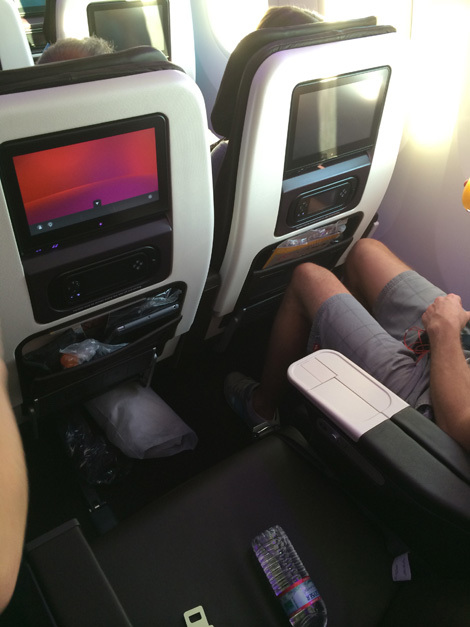 It offers 21 inches of width, 38 inches of legroom and eight inches of recline. The economy class seat is also much thinner, with supportive headrests. The product is almost 19 inches wide, has 31 inches of legroom and six inches of recline. 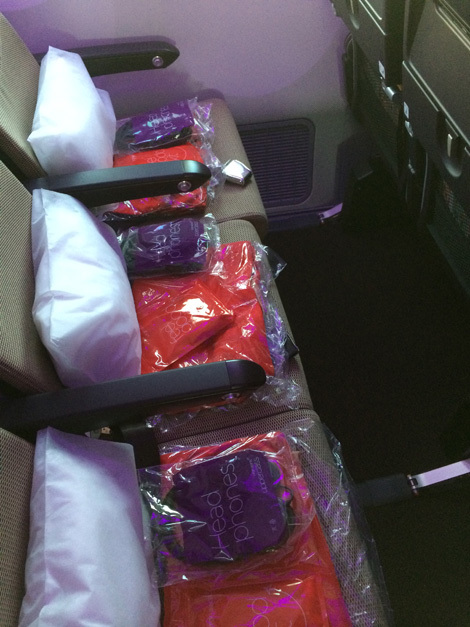 Amenity kits, heaphones, blankets and pillows are provided. There are also extra-legroom seats in exit rows 45 and 53, as well as tan-coloured seats A-B-C and H-J-K in row 47 with 34-inch pitches. 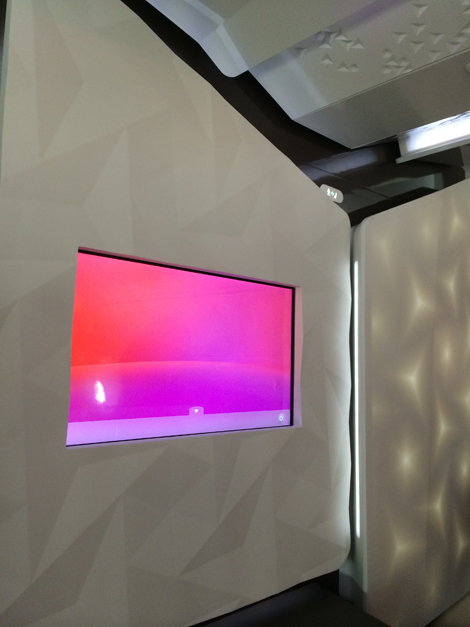 At the back of the economy cabin, by the galley, will be a “selfie hotspot”. What about the overall look of the interior? Nik Lusardi, design manager for customer experience, said: “The whole cabin, the colour range was developed for the A330s but we actually tweaked it again for the B787 so we have bought it more in line with where the brand is now — we are 30 years old so there is an air of sophistication in the trim and finish that runs throughout. 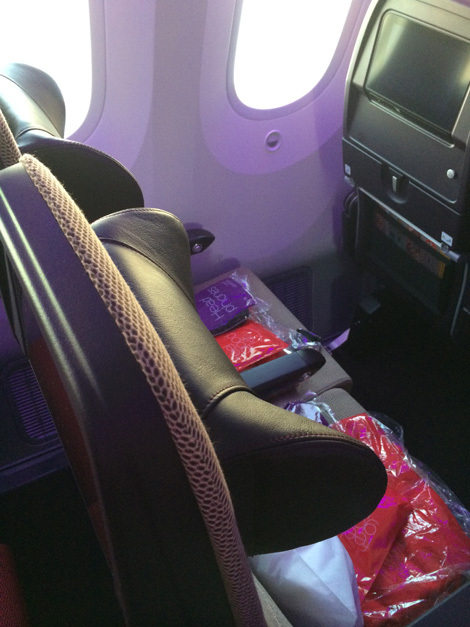 “You will find the same leather on the economy headrests as on the Upper Class seats. We tried to create a strand that runs through the cabin and the conduit for all that is the mood lighting that brings it all together. 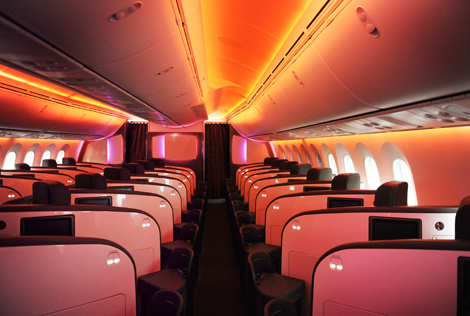 Customers will also find electro-chromatic windows that go darker at the touch of a button, plus less noise from the engines and increased humidity so hopefully you will feel better when you land.